We have entered the Dog Days of Summer, and a quick search of the Google told me… well, it told me that what I thought was the meaning... was not. I thought The Dog Days Of Summer was something along the lines of the drudgery that is late summer. Vacations are winding down and everyone is back home preparing for the new school year. The excitement of those summer flower beds and gardens have turned into the constant battle of mosquitos and pulling weeds. The once crisp cool swimming pool is now bathwater that has to be chemically shocked more because algae growing more frequently is rampant more than the actual pool is being used. 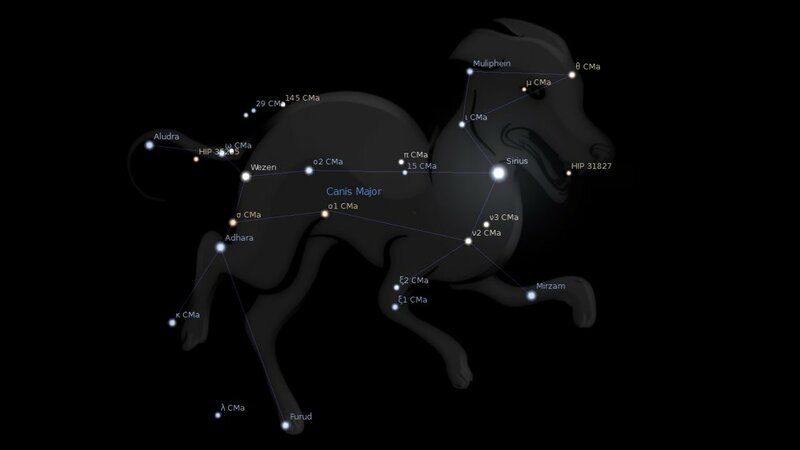 So, It turns out, the Dog Days of Summer has something to do with the rising of the Dog Star, Sirius… and when the heat of summer sets in; typically middle of July to early August. It also described the period before the Nile River floods, silt washing over the fields, and plantings. If you’re truly interested in Sirius rising then you should go ahead and jump onto your Google to find out more. It really is interesting! My point in all of this is that yes, we are at the tail end of summer. Yes the hot temps have well set in. Yes people are dragging their butts and not really wanting to do much… but I may have a nice simple cure for that. A LIGHT LUNCH AND SANGRIA ON THE PATIO, of course! No, you don’t have to invite folks over to share, but if you’re missing the fun and excitement from friends or family from earlier this summer and want to rekindle some of that, then invite them over! At least for Sangria! A couple of weekends ago I was in New York visiting my cousins in the Hamptons. I know it sounds bougie, but seriously it was the most wonderful time; like ripped out of the pages of an Ina Garten episode of Barefoot Contessa! My sweet and beautiful cousin Lili was hosting her husband’s family at their home, and well… I happen to be there too. Lili was telling me about her amazing Avocado Toast that she makes for her two young boys, and how they enjoy spicy honey drizzled on top. (Don’t worry… I’ll do something with spicy honey soon!) Lili had also made a batch of Sangria for everyone to enjoy, so I started thinking about what I would do for a “Toast” and “Sangria” afternoon. A beautiful day in the Hamptons with family and new friends was the catalyst for this week’s recipe. The “TOAST” idea was to simply pop open a jar of my Garlic and Green Chimichurri Sauce and add to the chickpea salad. If for some unholy reason you do not have a jar of my Garlic and Green, making your own homemade chimichurri sauce works too. Again, consult the Google for a recipe you would enjoy making. The bread you use for the toast is completely up to you. I enjoy a nicely structured, whole wheat, sourdough bread, and I think a toasted seed flavor would compliment this dish so well. I chose to go with a local bread baking outfit here in Oklahoma City called Heritage Grains Bread Company (hover and click), and the choice, in my opinion, was perfect! Their organic whole wheat SEEDED sourdough is wonderful… and supporting local is always a great thing! Check out the recipes below and jump back into whatever is left of your summer. I hope you enjoy!! Add your drained and rinsed chickpeas to a mixing bowl. To that add the cherry tomatoes, halved or quartered depending on their size. Add three tablespoons of chimichurri sauce and give it all a good mix. Set aside and let the salad develop its flavors. Slice your bread, at least two slices per person, about 1/4 inch thick. Toast the bread on both sides in a conventional toaster, in the oven, or even grilled! When ready to serve, spread each toasted slice with a nice layer of soft goat cheese. If goat cheese is not your fancy you may use Cream Cheese or even Greek Yogurt. Add the toasted almonds to the chickpea and tomato salad then mix in. I do this before serving because I like to retain the crunch of the almonds. Taste for seasoning. 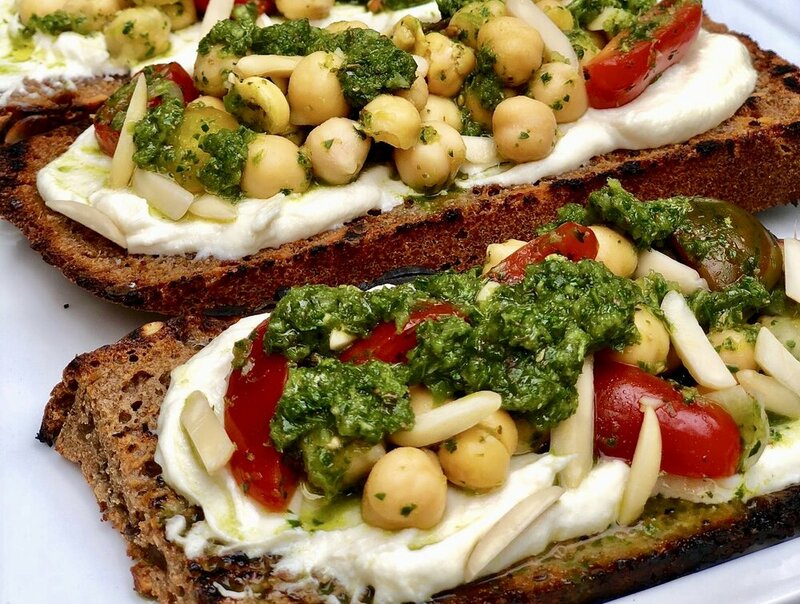 Top each slice with a generous portion of the chickpea salad. Drizzle a little more chimichurri sauce on top and serve right away! In the bottom of a sturdy non metal pitcher, tear off a handful of fresh mint leaves and toss into the pitcher. Add a slice if each of your citrus. With a bar muddler or heavy rounded wooden spoon, gently crush the citrus and mint to relate the natural oils and flavors… like you would for an Old Fashioned. To the pitcher add your wine, cointreau, and the rest of you citrus slices. Reserve the extra point for garnishing glasses. Stir the sangria together and place the fridge for one hour or longer. When ready to serve fill glasses with chipped ice and sprigs of fresh mint. Pour the sangria over the ice and mint, kick back, and enjoy!